An Eco-Mer initiative since 2010. "We are all embarked in the same ship, the Earth !" The Filipinos are great sailors and are aboard many yachts anchored in port Vauban and in the ports of the Côte d’Azur. It is therefore natural that a vast chain of solidarity has been established among the seafarers to help the victims of typhoon Mangkhut, which in mid-September hit the great archipelago of South-East Asia and made a hundred dead. It left thousands of destitute inhabitants behind. 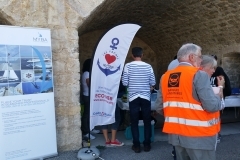 It is to help these victims that the “Les Yachts du Cœur” operation, launched in 2010 by the Ecomer association, launched the “Container of Hope” mission. The goal: collect donations, non-perishable food, clothes and shoes, tools, etc. and send them to Manila. 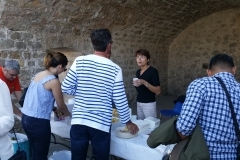 Saturday morning, on the port Vauban, the container was there and, after a blessing, the volunteers formed a beautiful chain to fill it. Donors have been generous! 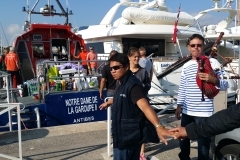 Jean-Luc Annone, President of Ecomer, hailed the action of Major Jean-Yves Roger, President of AMMAC Cannes-Pays de Lérins, “who brought together the Filipino community to make this Yacht du Coeur a success”. 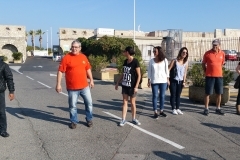 2018-06-30 A total of 20m3 of donations from a yacht captain who owns a yachting company, have just been offered and passed on successfuly to a handicaped lady in dire need of help. Mission Status. Accomplished ! Arrived Roseau Port, Dominica 20th May 2018. 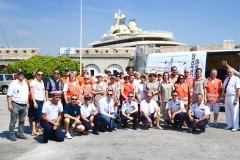 Our “container of hope” filled up with 1.3 Ton of French Riviera yachts crews donations aboard “FLEUR N” container ship was dropped off in Fort de France, Martinique on the 17th may 2018. Then Betty K IX, cargo ship, picked it up and delivered it to the Dominican Government thanks to our partner YachtAid Global, in Roseau port, Dominica, 20th may 2018. 2018-04-14 Yachts du Coeur: Port Canto, Cannes. 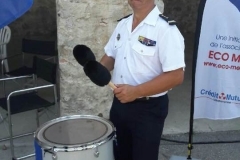 Following our forums concerning “Marine Quality”, Inauguration of the “Marine Eco-Pledge” by the City of Cannes Mayor, Mr David Lisnard. Valid for all ports in Cannes. 2017-12-09 Yachts du Coeur. 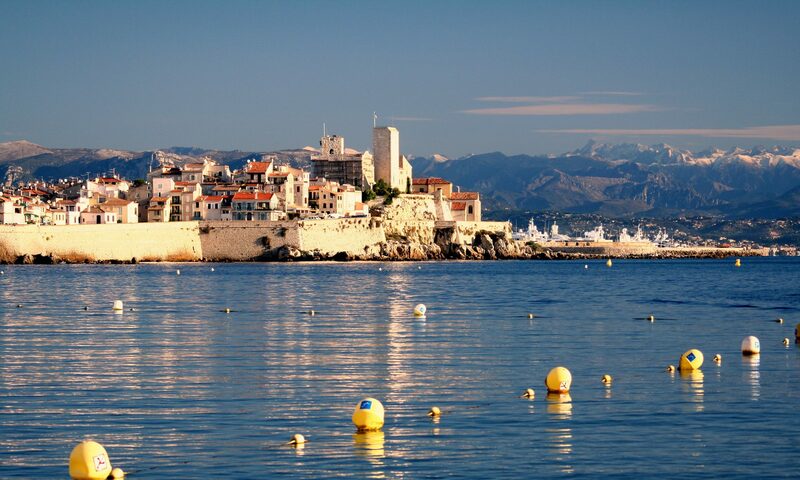 Port Vauban Antibes. 10m3 of aid to the Caribbeans, via My Mary Jean II . Mission Status. Accomplished ! Arrived Antigua 6th Jan 2018. My “Slipstream”, on an aid mission to the Carribeans, collected 12m3 of donations from yachts crew in Palma. 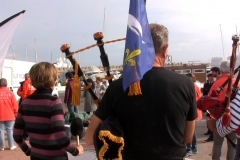 She then arrived in Marseille where French Riviera based crew donated 18m3 of donations via ECOMER who collected them. Saturday 25th November 2017, we organised a Yachts du Coeur event to transfer all the donations onto Slipstream’s trucks. Fully loaded with 30m3 of donations, she then departed Marseille on the 26th of November 2017, destination : Dominica. My Slipstream has now arrived in Dominica 2017-12-13. Yes, you did it! Congratulations to all who took part in this charity donation. We are very proud of you all ! 2017-10-14. 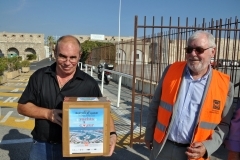 Yachts du Coeur Port Vauban, Antibes : One Ton of Food delivered to the 06 Food Bank . Mission Status : Accomplished ! 2017-06-22. 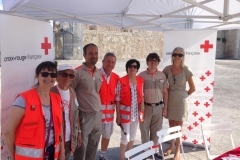 Yachts du Coeur Port Vauban, Antibes : 12m3 to the French Red Cross. Mission Status : Accomplished !